An open editor will allow you to change profiles according to your taste. 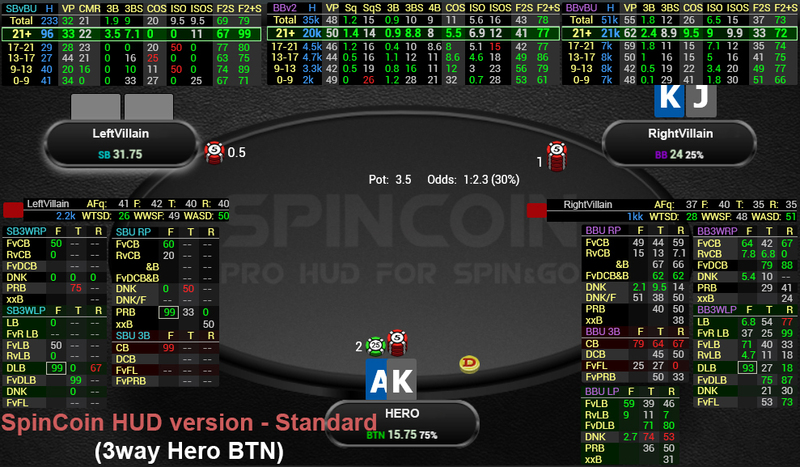 SPINHUD is fully compatible with PokerStars rules. 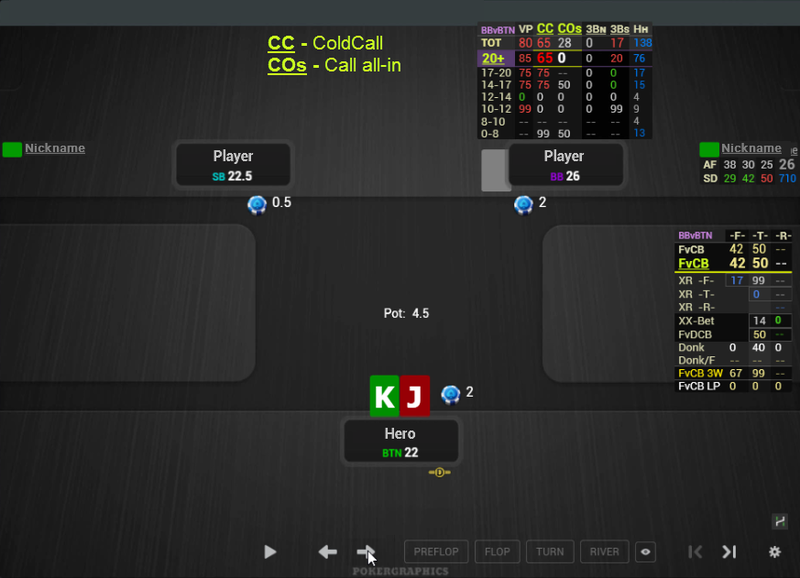 Collection of stats and pop-ups for Spin&Go games. 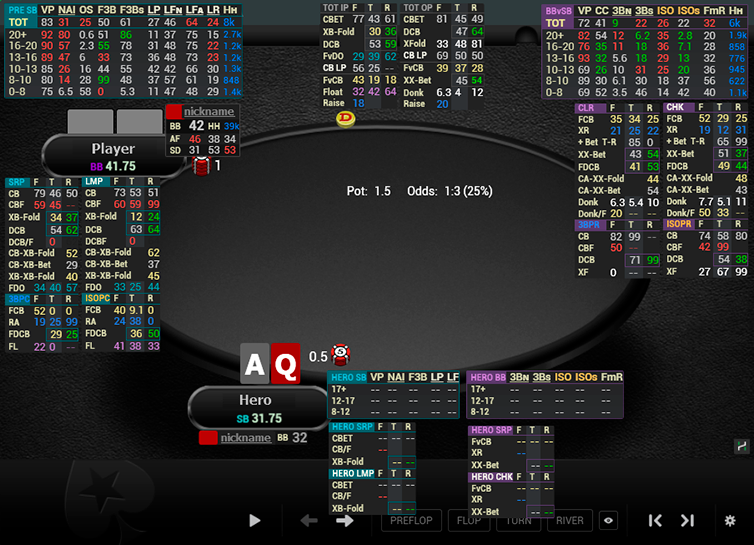 Ready to use HUDs, pop-ups for 3max and Heads-Up. Help with installation and setup. 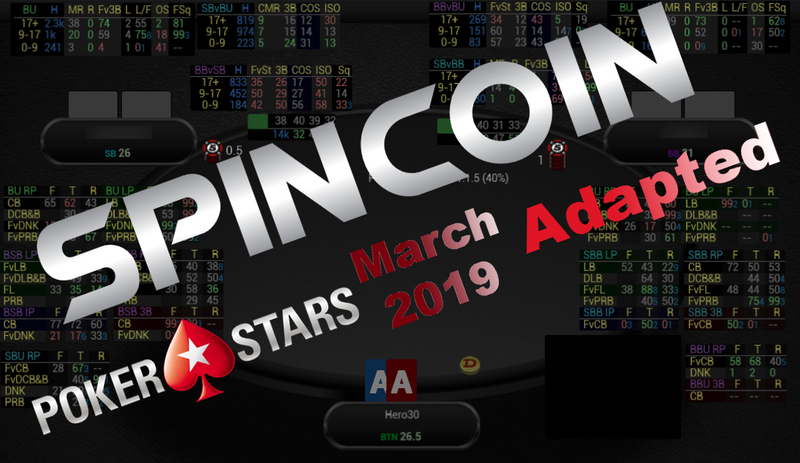 SpinCoin is adapted to the new Pokerstars rules, which came into force on March 4, 2019, you can read about the changes here. 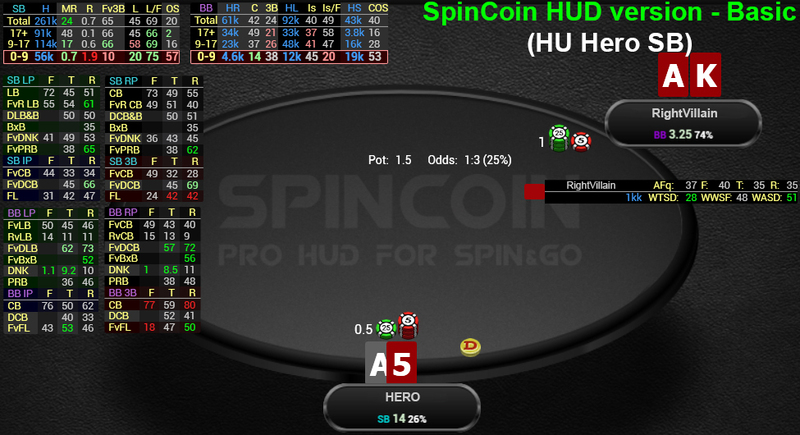 Hud is designed to play Spin&Go (and analogues 3max tournaments), and is also suitable for playing HU tournaments (3max part is not loaded). This is a set of huds starting from a primitive hud and ending with a hud for regwars at high limits. At any time you can switch to another one from the set. 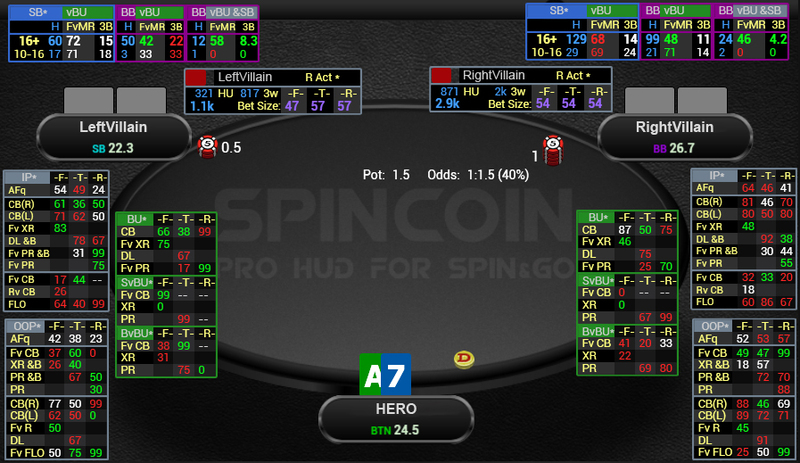 SpinCoin is designed to play in Spin&Go (and their analogues 3max) tournaments (including MTT 3max tournaments), as well as for HU tournaments. 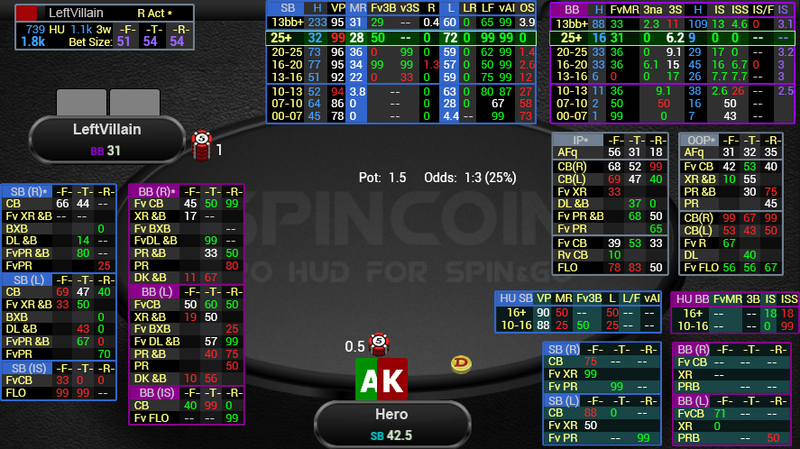 In SpinCoin, there is a huge amount of stats with detailed layouts for sizings and ranges, both during the game (through the huds) and in after-game analysis (via popups). 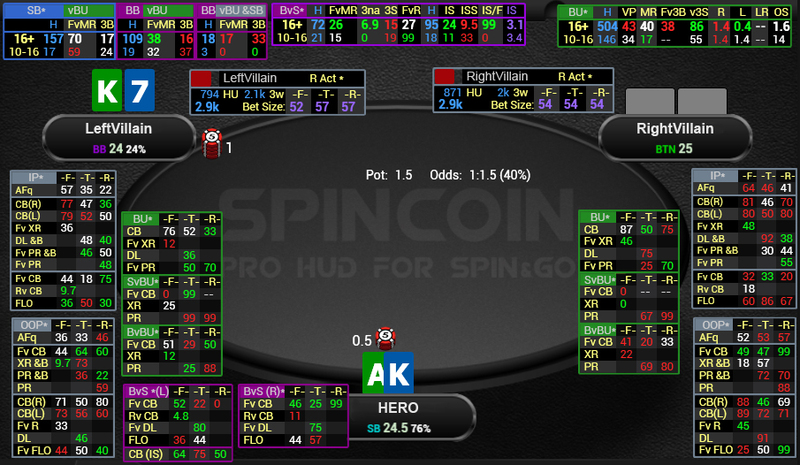 SpincoinPro - Hud imprisoned for players of high limits, just irreplaceable in the regwars. With this you feel like a Boeing pilot. 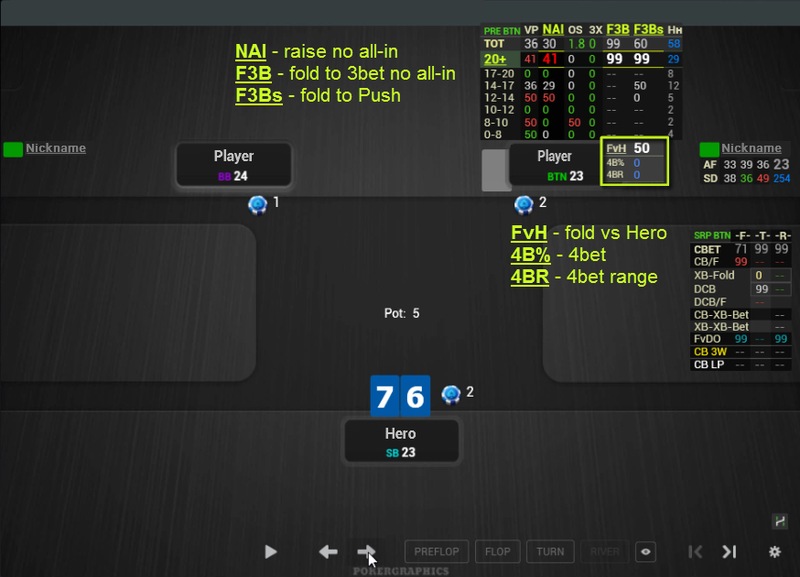 Also strong recommended for playing HU SNG. 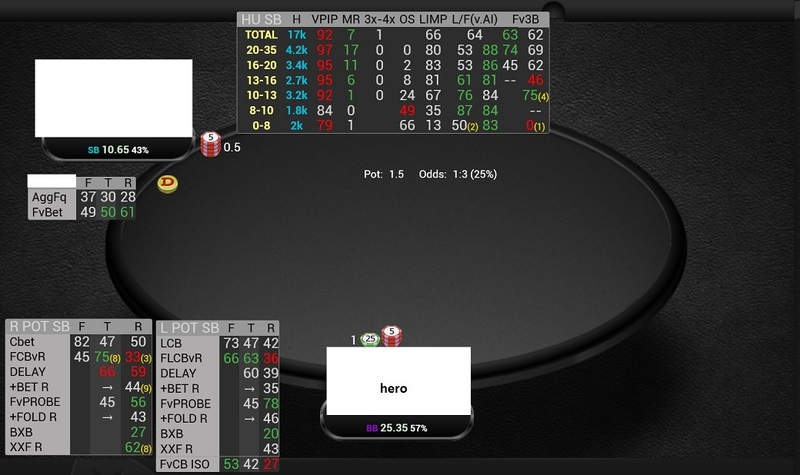 The maximum number of stats on the table. 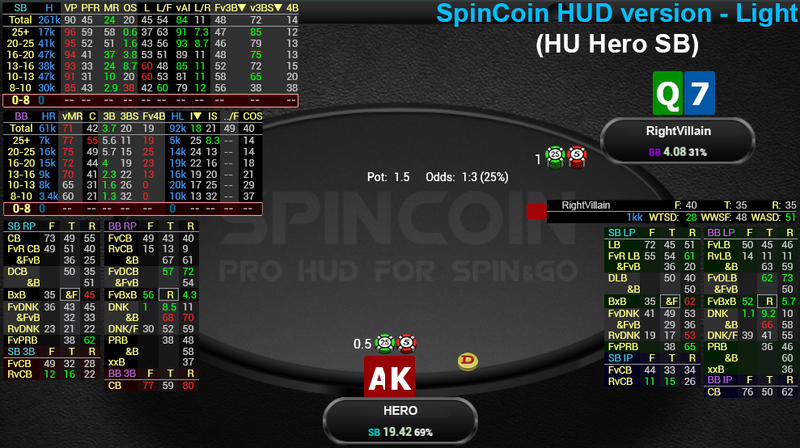 SpinCoin (Standart) - Hud for medium limits. 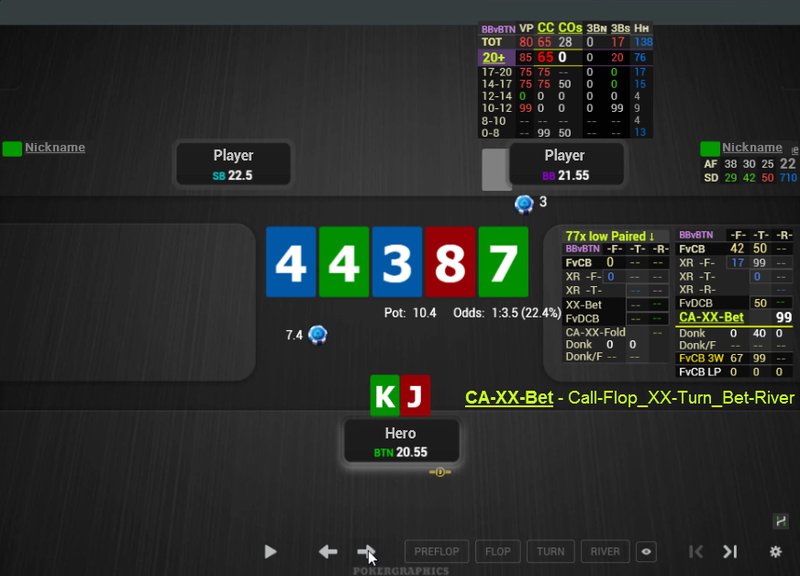 Preflop almost does not differ from Pro version, but postflop is already cropped, but it's still a lot. Universal soldier choice. 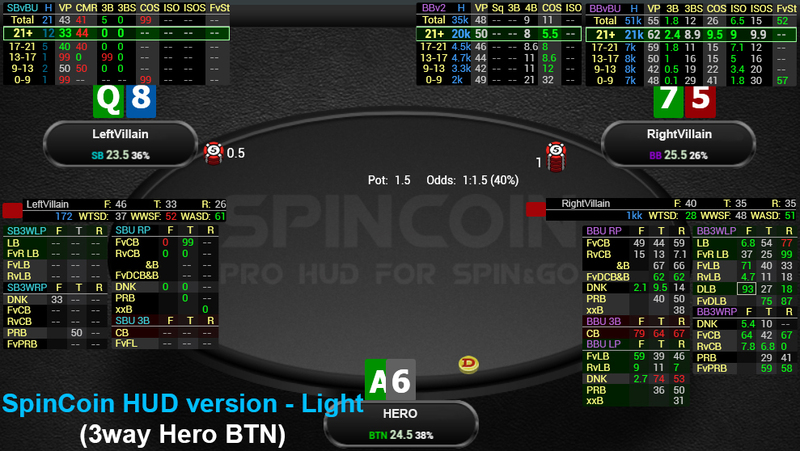 SpinCoin Light - Hud for low limits, the number of stats is significantly reduced, but even so the hud just scares the amount of information MTT players. Adaptation step when switching from old trackers to Hand2Note. 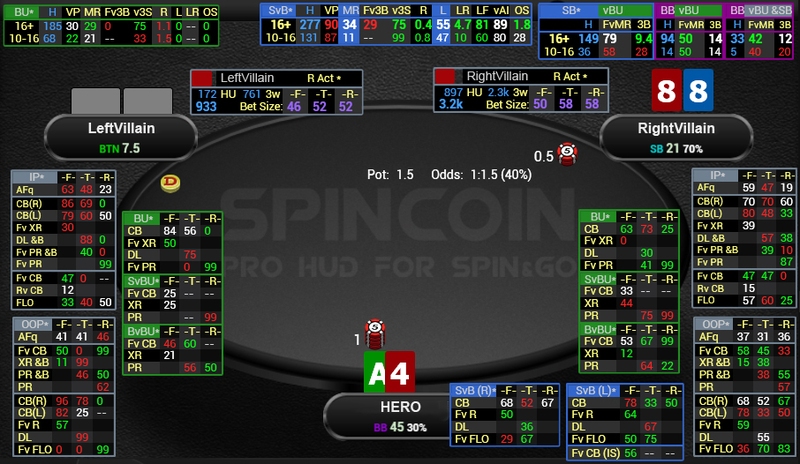 SpinCoin Basic - Hud created by the old chinese traditions - from it they cut off everything that is possible until it became impossible to play and returned the last cut off stat to the place. 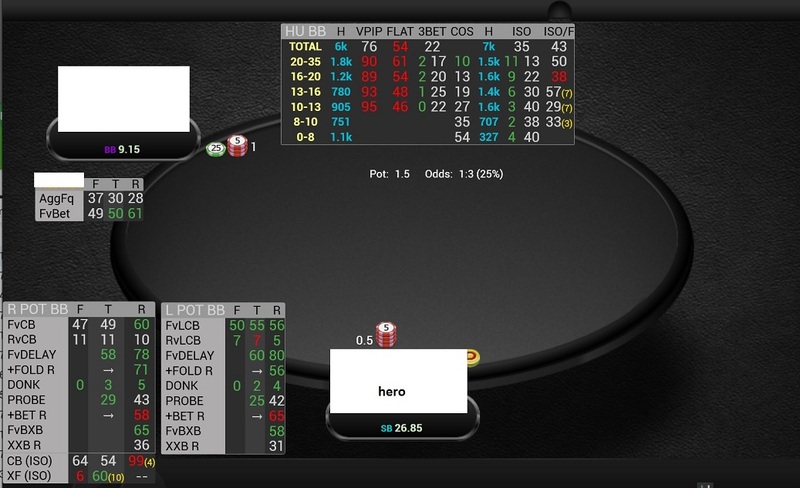 The ideal choice of players in the GTO, who believe that this is for weaklings, but still understand that exploit is sometimes needed in this tournaments. 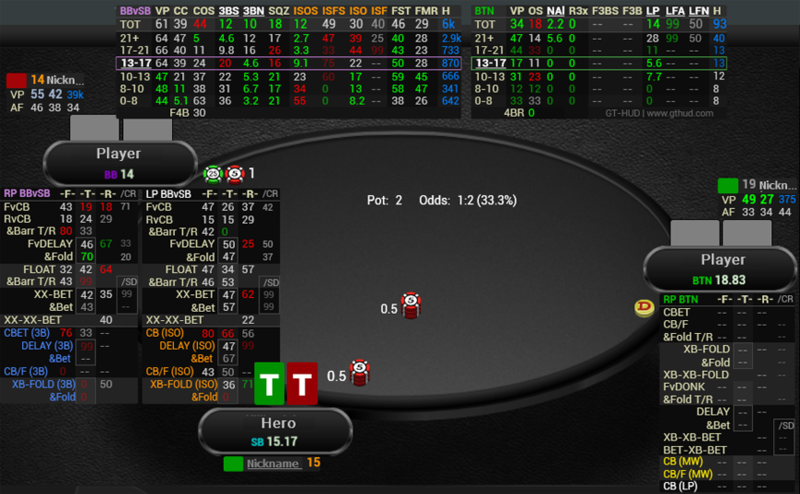 Less informative is the only standard hud from PokerTracker4. 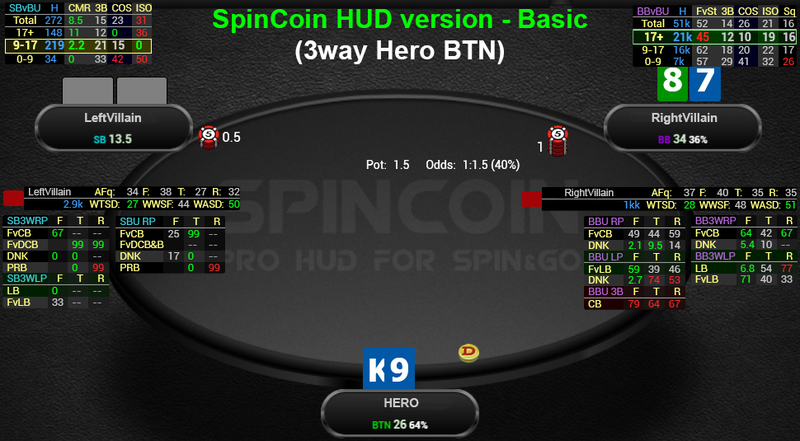 SpinCoin it's actually two huds in one - a separate hud for 3max and a separate hud for HU, switching between huds takes place without the player's participation and does not require the presence of additional software, as in the other trackers. 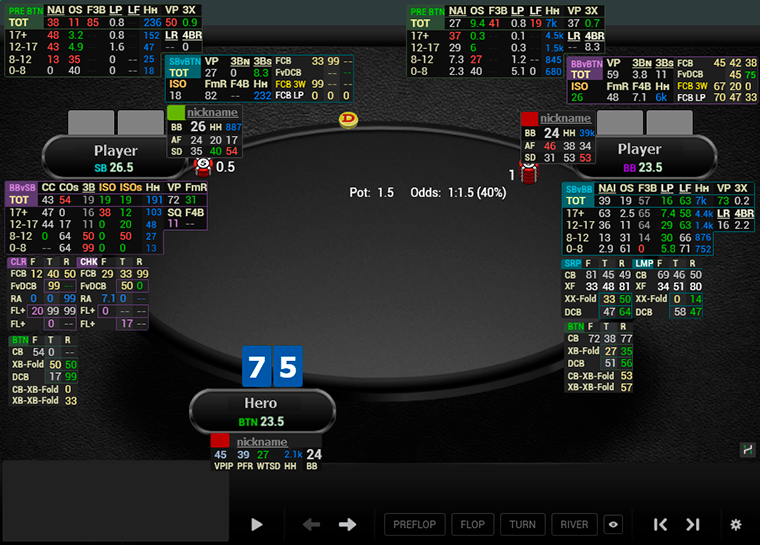 This hud will also be fully operational when playing in HU SNG tournaments (a 3-max part will not be loaded). 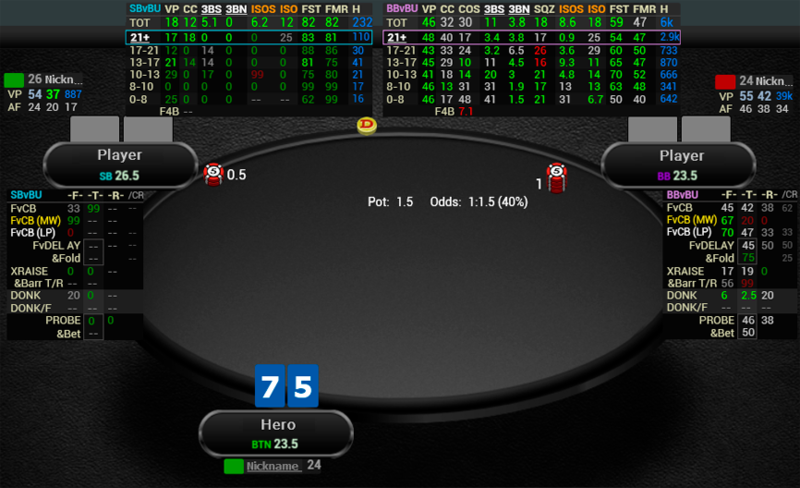 Hud is made in the style of the well-known CoffeeHud's (which was used by the majority of players HU SNG), for easy adaptation of users at the beginning of use. 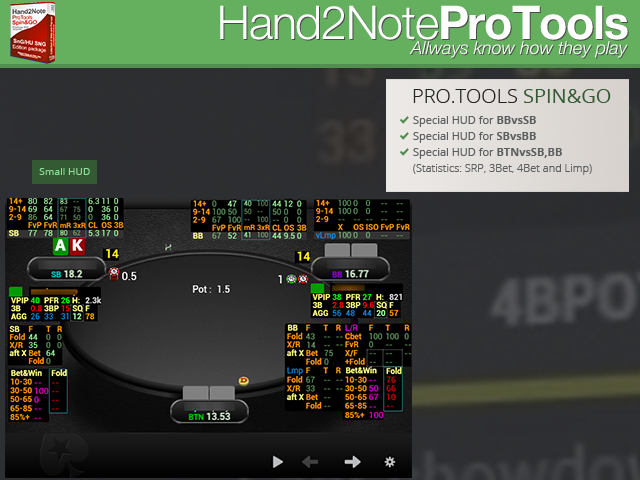 Due to Hand2Note's capabilities, the hud is executed on the principle of positioning, i.e. 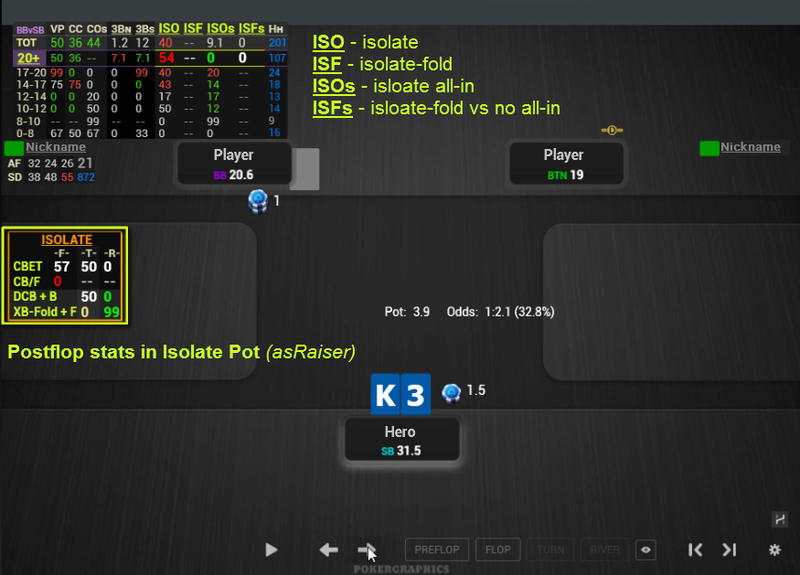 his tables are displayed on opponents, depending on your and their positions in the game. 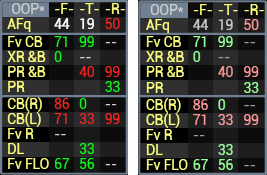 The fonts in the table headings are colored according to the color scheme of the positions applied in the Hand2Note tracker - this improves the orientation in the stats. 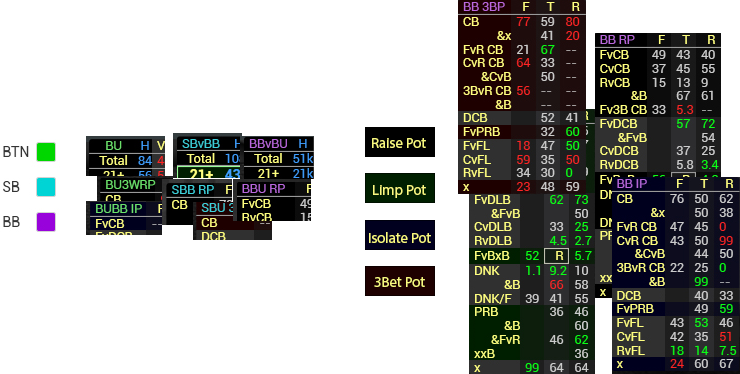 We also tried to match the color schemes of the backgrounds of the tables for postflop, in order to understand at a subconscious level which pots belong to the stats and not to confuse them with each other. 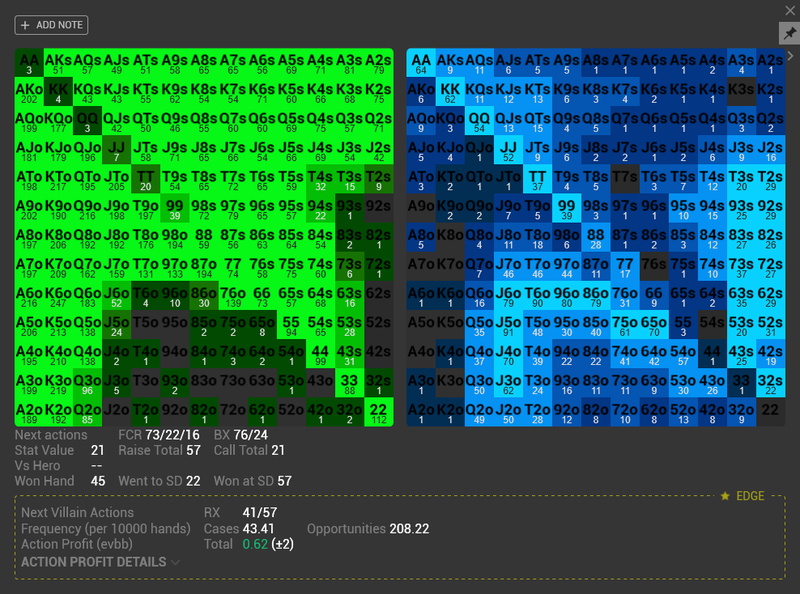 In the tables of hud, the dynamic allocation of statistics of the current effective distribution stack is implemented, which allows you to quickly find the necessary statistics in a large number of digits. This is accomplished by a combination of highlighting, border, and font thickness. 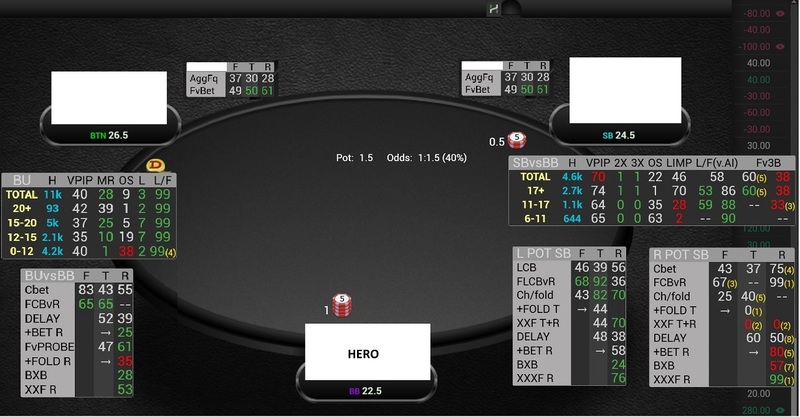 Hud allows to display heat maps for all statistics, for PokerStars this function is implemented in text form, in accordance with the rules of this room. 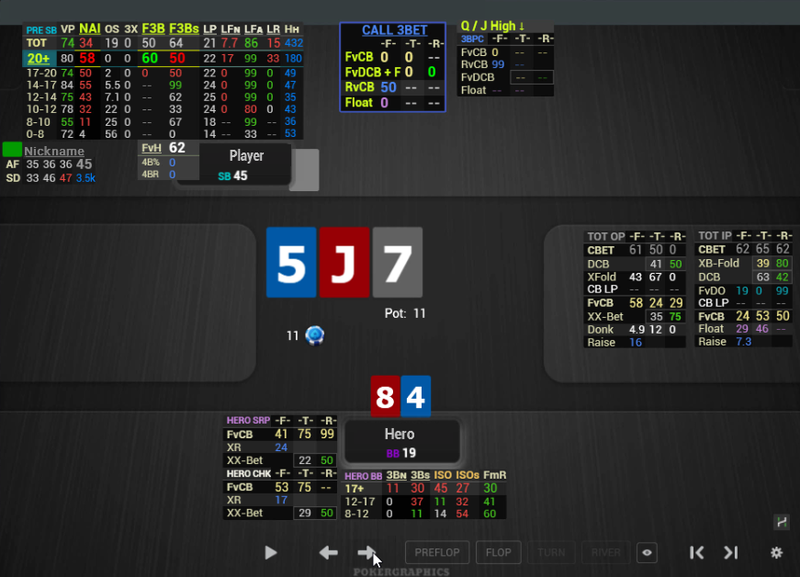 Functional diagram output works in popups for all rooms without exception, which additionally allows for a visual analysis of gaming sessions. 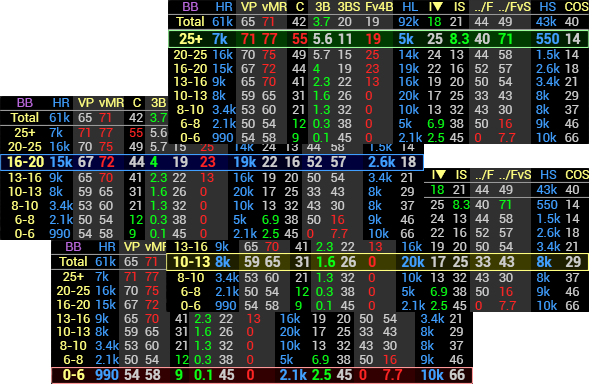 All the stats in the hud have color ranges depending on the aggression - green is more tight, gray is the norm, reds are more aggressive. Config contains two versions of each hud with a bright and grinder (quiet) coloring of the stat ranges. 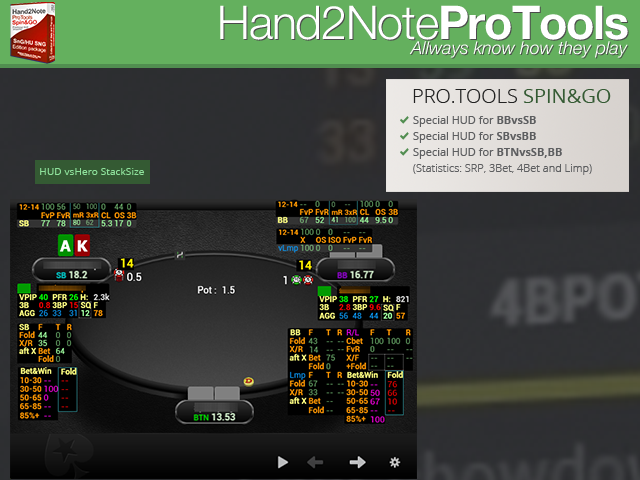 Together with the hud we transfer the modified settings of the Hand2Note tracker. 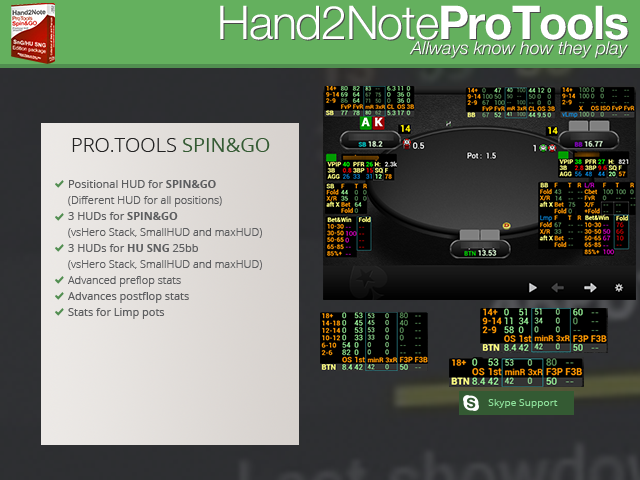 We completely redesigned hand groups at the postflop, significantly expanding them to the specifics of the Spin&Go and HU tournaments, with an adequate color scheme with a logical change of colors to improve the perception. 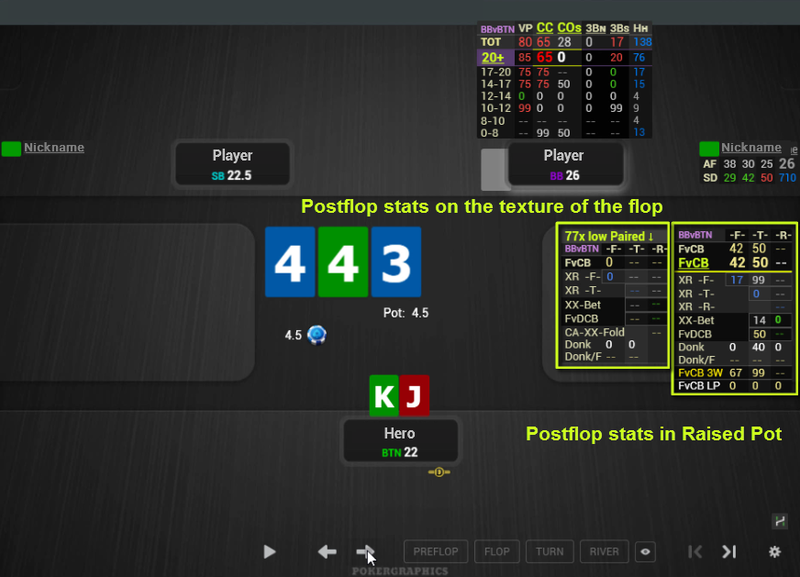 We also introduced a large number of postflop statistic layouts depending on the structure of the boards. 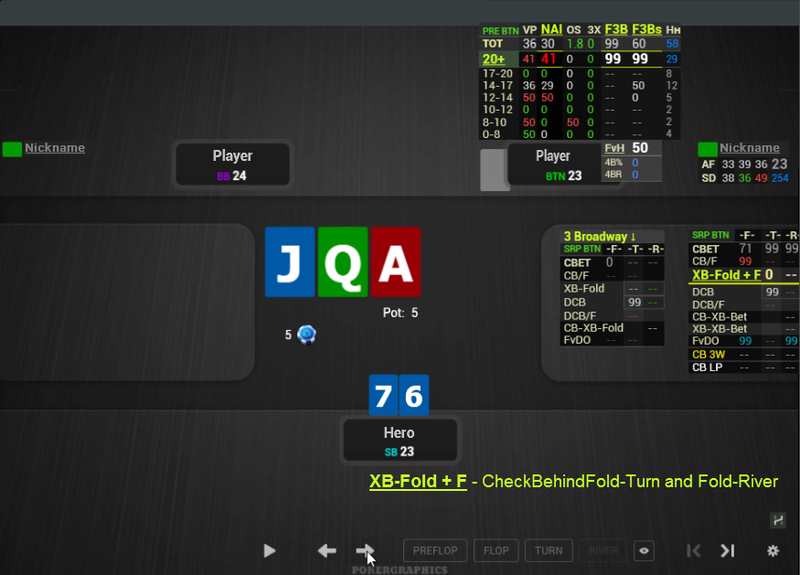 Groups of hands and boards appear in the extended standard popups on the stats and significantly improve the analysis of the game. 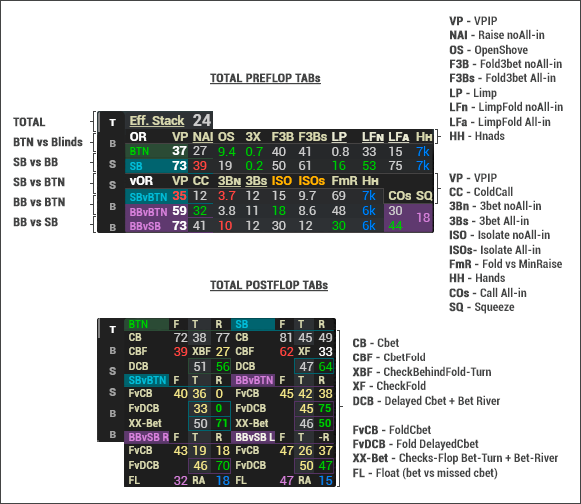 In addition, we have worked on sizings of bets, calls and even folds - in our hud, there are diagrams and stats broken in sizing (the BET SIZING section) in the standard popups. Each hud has tables with Stats on the Hero (the background of the tables is purple so as not to be confused with regular stats). By default, they are disabled for display, but if necessary, their display can be turned on quite easily in a few clicks in the Hud Editor. Please contact support for more information..
We paid much attention for after-game analysis. 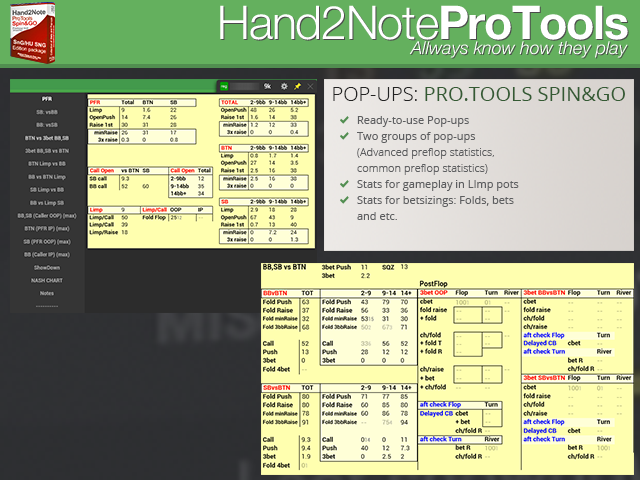 For parsing the base of hands in popups for each player (which can be called from the list of players), a large number of statistics are created that are not output to the hud. 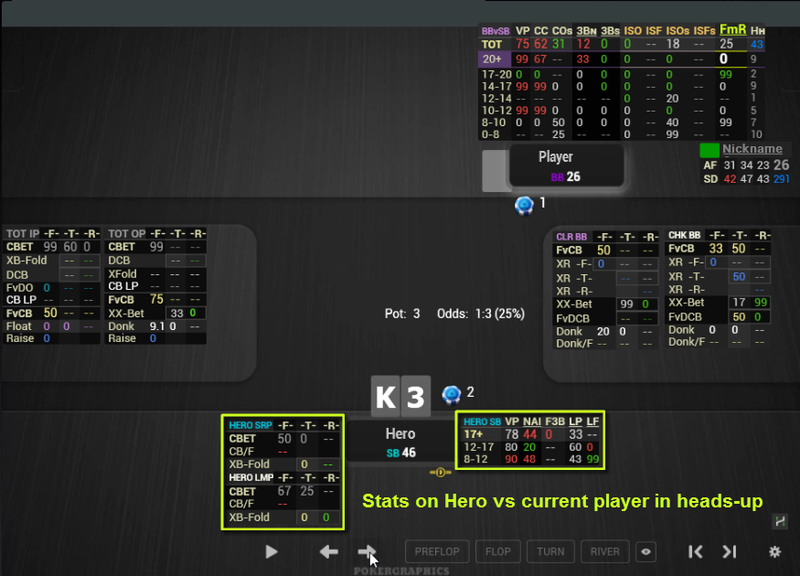 Even those stats that we do experimentally are available to any user of our hud. 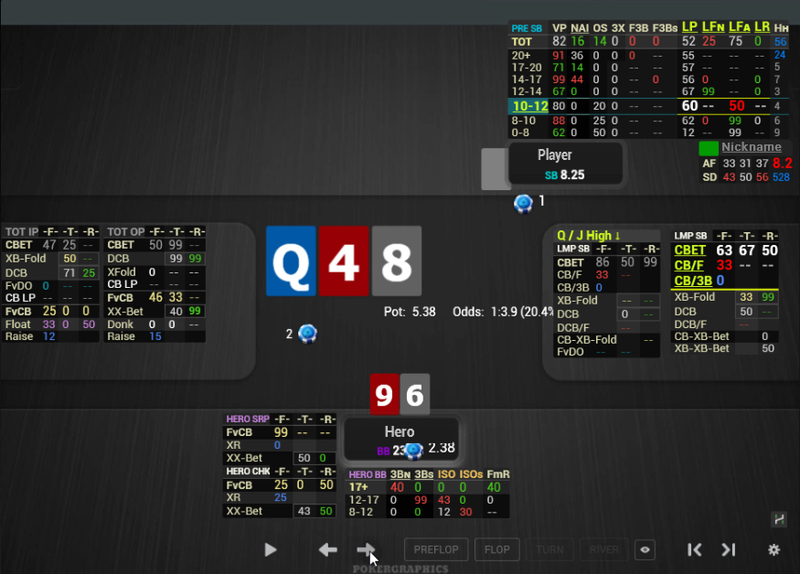 We are constantly improving the huds and popups to analyze the game, taking into account the wishes of the players. 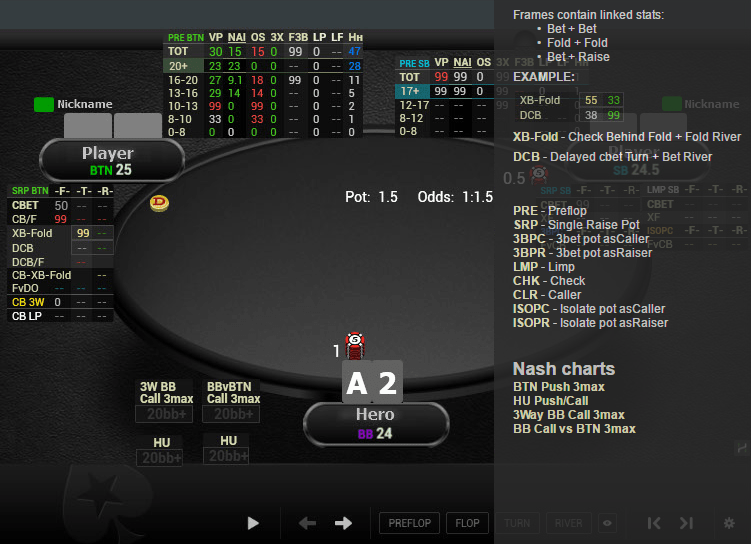 The tables of huds and popups are open for editing - you can make any changes and adjust for yourself. All future updates are FREE. We stick to this policy from the beginning of our sales and do not intend to change it in the near future. Regardless of how and where you purchased our hud, we will help you free to install and configure your hud with Skype or Teamviewer. We will answer any questions about the hud, we will implement individual adjustments of the hud, we will make individual stats, we will help with any problem that we are able to solve. 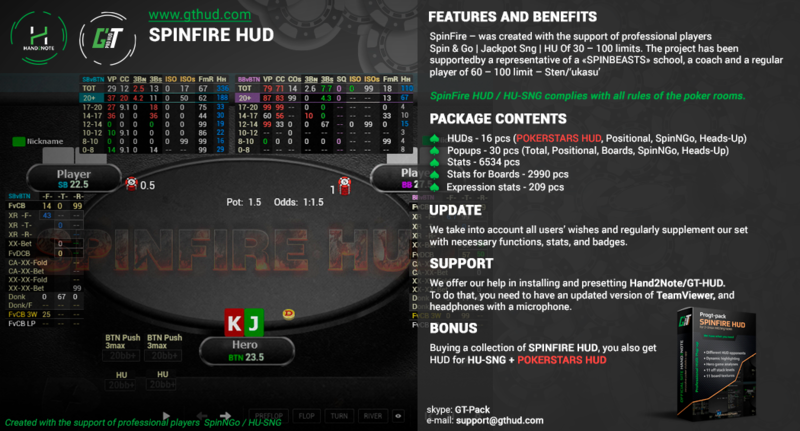 SpinFire HUD - was created with the support of professional players Spin & Go | Jackpot Sng | HU Of 30 – 100 limits. 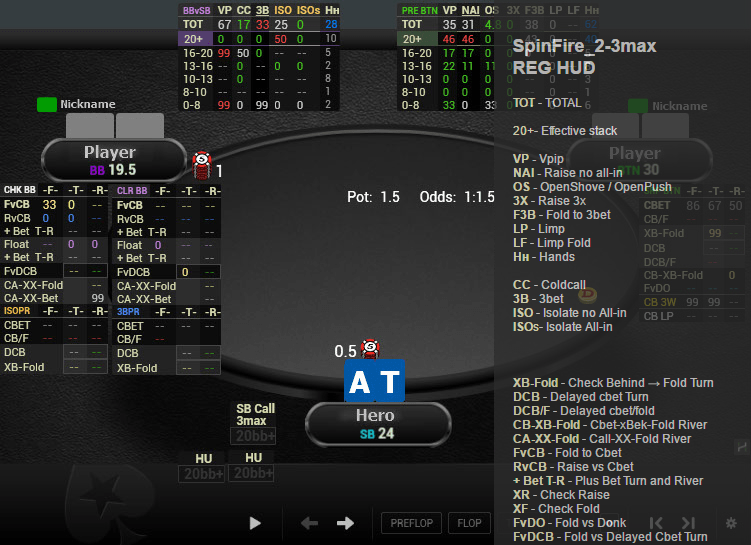 SpinFire HUD is fully compatible with PokerStars rules! 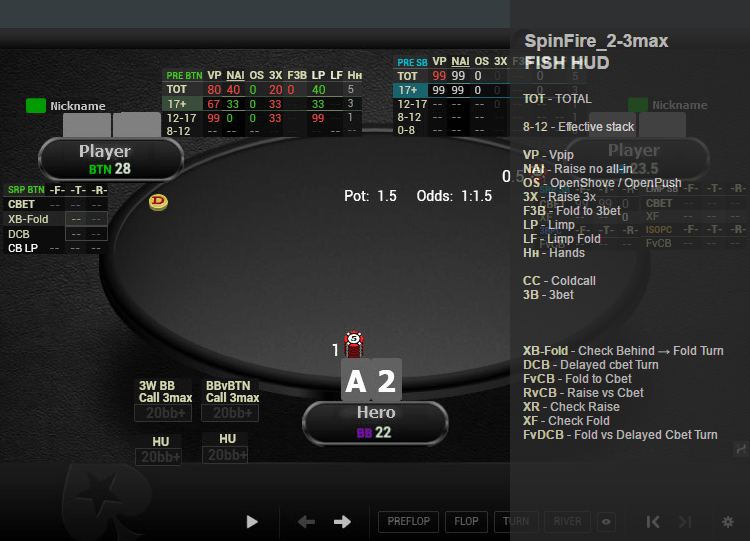 SpinFire HUD - proved itself as a convenient and reliable tool, necessary for every professional player in Spin & Go. 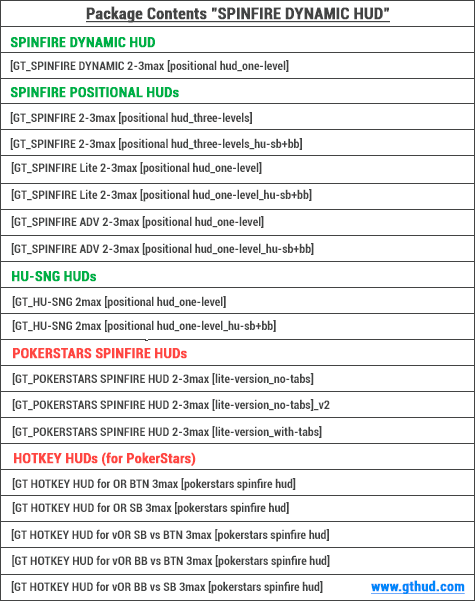 We offer our help in installing and presetting Hand2Note/SpinFire HUD. To do that, you need to have an updated version of TeamViewer, and headphones with a microphone. 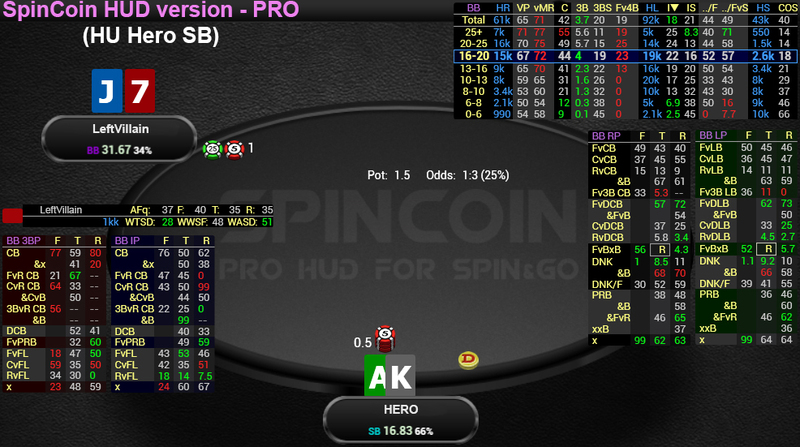 Positional hud for playing Spin&Go (and analogues) tournaments, is also great for playing HU SNG tournaments. 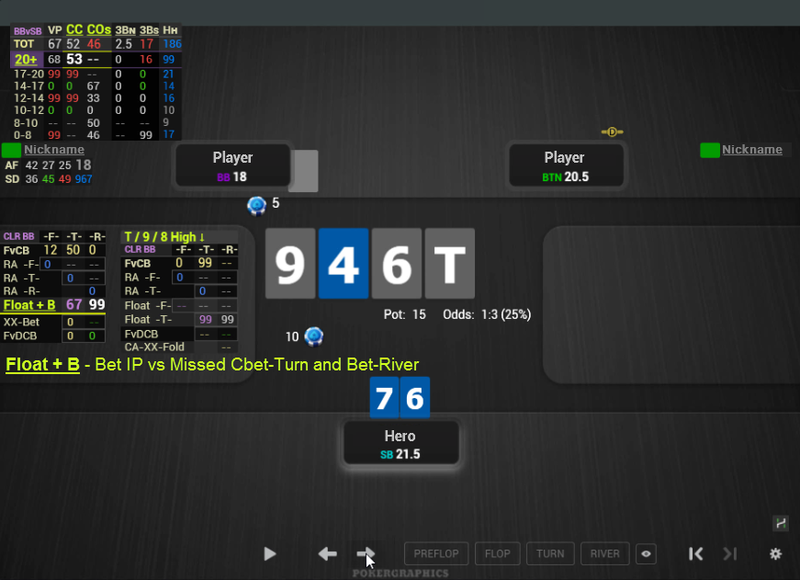 The design is in hud style from school SmartSpin. Additional discount for owners of SpinCoinPRO. 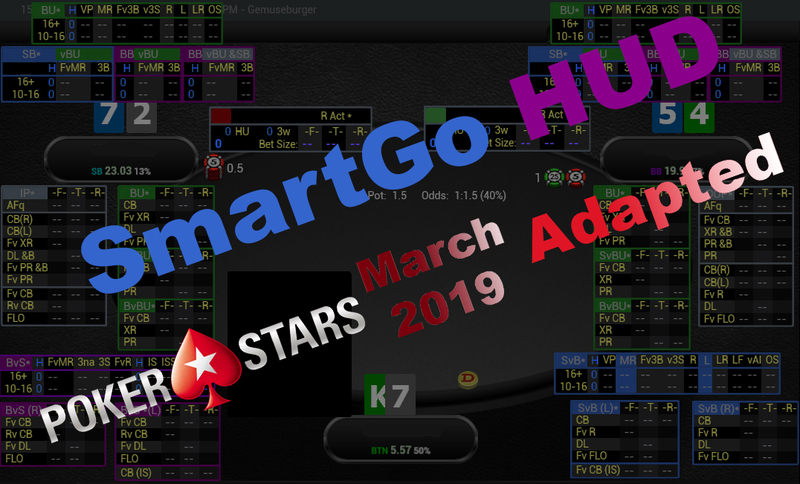 SmartGo Hud is designed to play in Spin&Go tournaments on Pokerstars and their counterparts in other poker rooms, as well as for the play HU SnG. 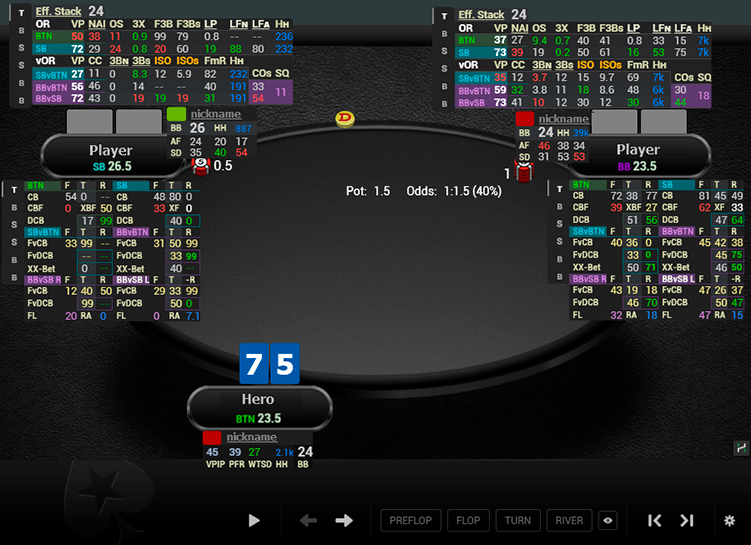 Hud is made in the style of Hud for PokerTracker4 from pokerschool SmartSpin. 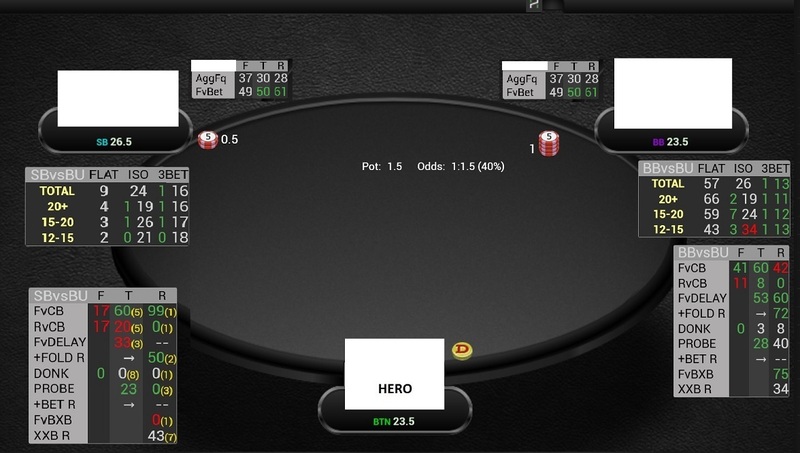 SmartGo Hud independently switches from 3way to HU depending on the number of players at the table, without using additional software. All the stats in the hud have standard popups with detailed blocks for sizings and ranges that can be used both during the game (through the hud) and after the game in analysis (via popups). 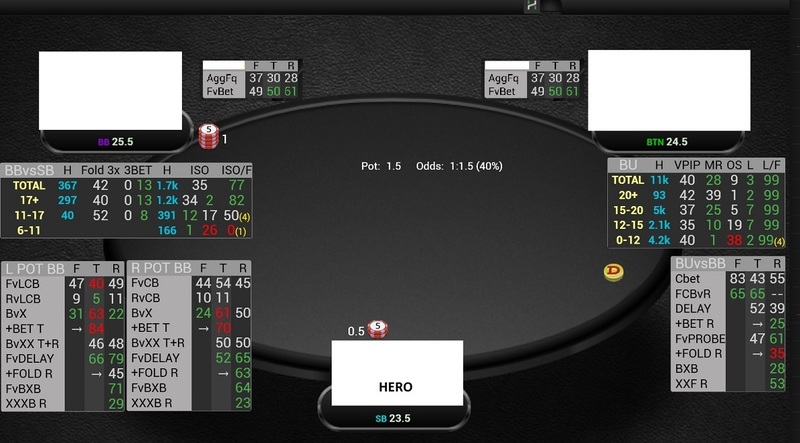 Also in SmartGo Hud there are additional popups, they are attached to cells with an character asterisk at the end of the name - *. 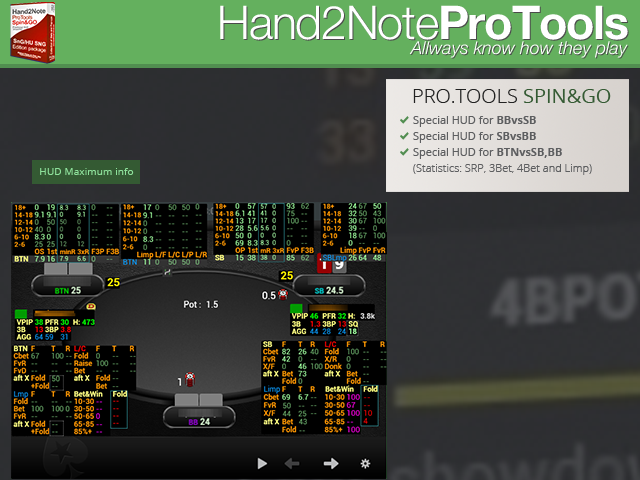 Due to the capabilities of Hand2Note, the hud is made in accordance with the principle of positioning, i.e. 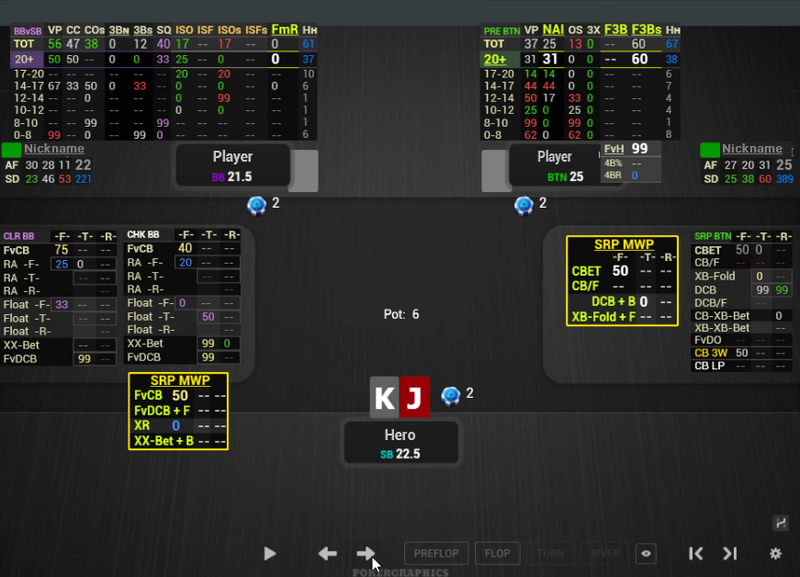 some of its spreadsheets are displayed to opponents, depending on your and their positions in the current hand. 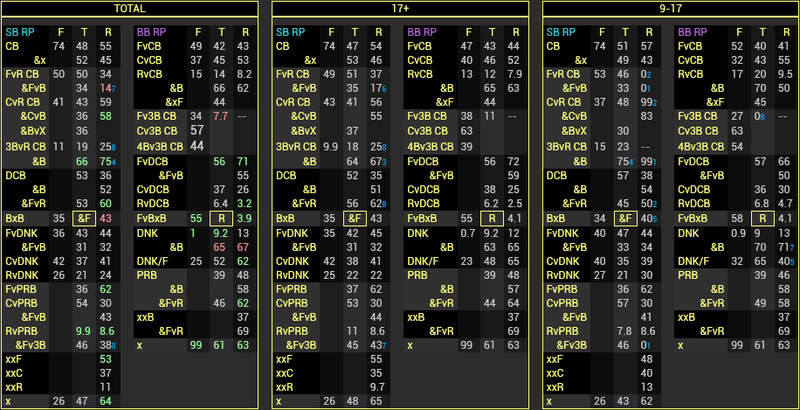 Also, the coloring of the spreadsheets of the hud is applied depending on the position. 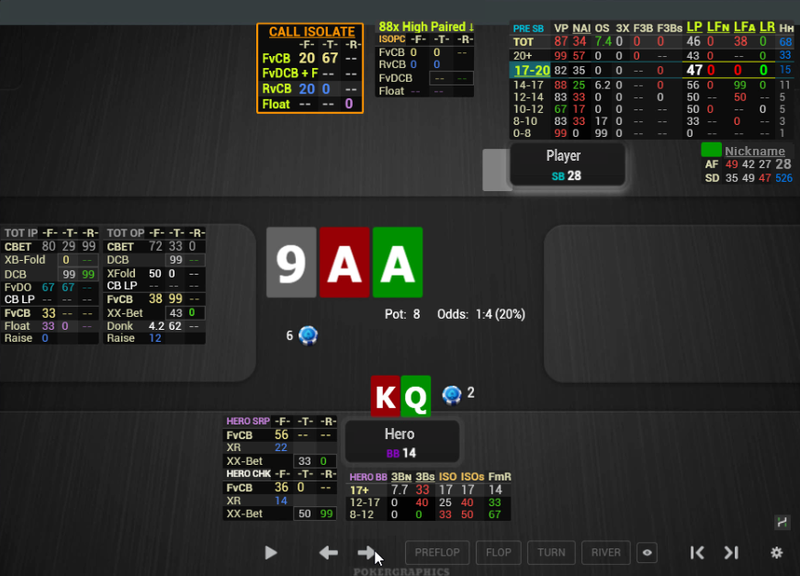 Based on the standard colors of the positions from the tracker Hand2Note. 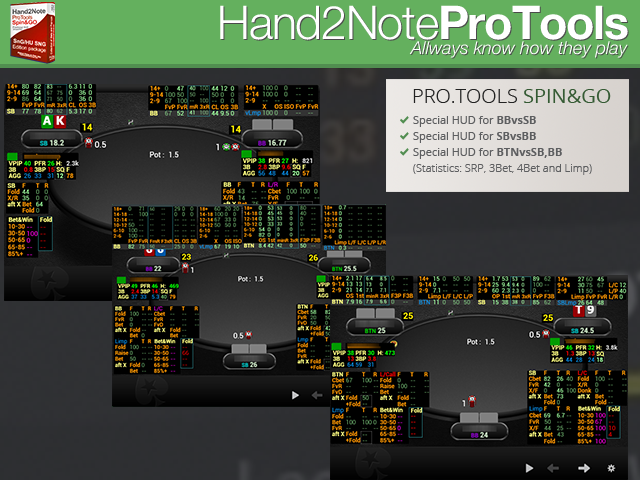 For most effective HUD work, it is highly recommended to use additional programs that can transfer stack sizes, current hand history, etc. data. 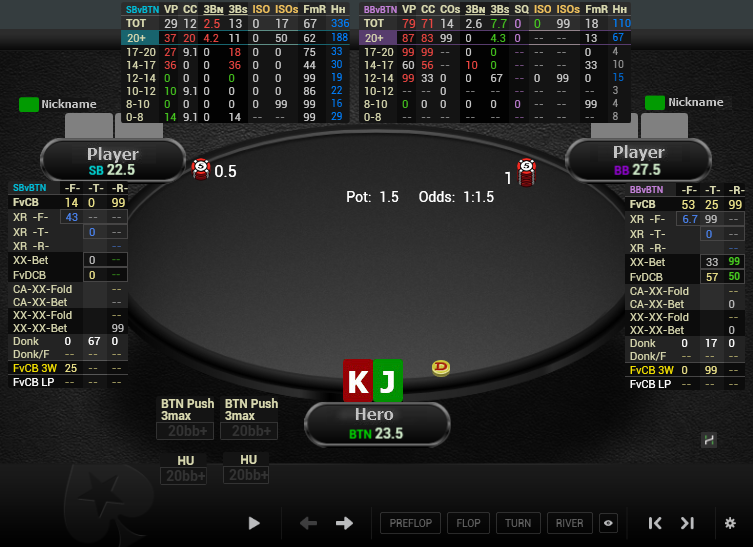 Depends on room you play it can be StarsHelper, SessionLord, 888Caption, iPokerTools and so on. 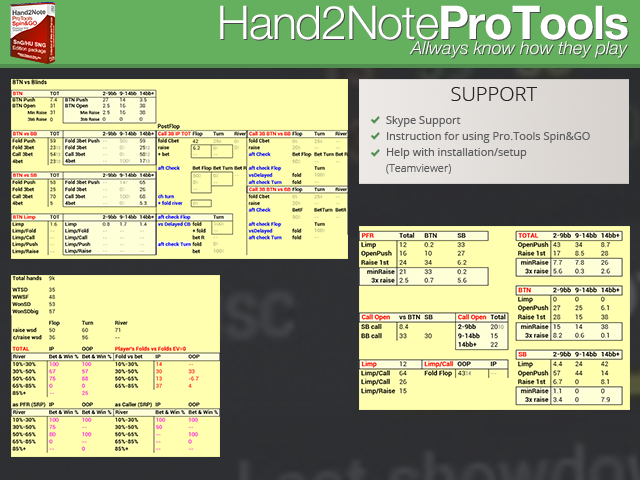 The list of supported programs you can find on Hand2Note website. 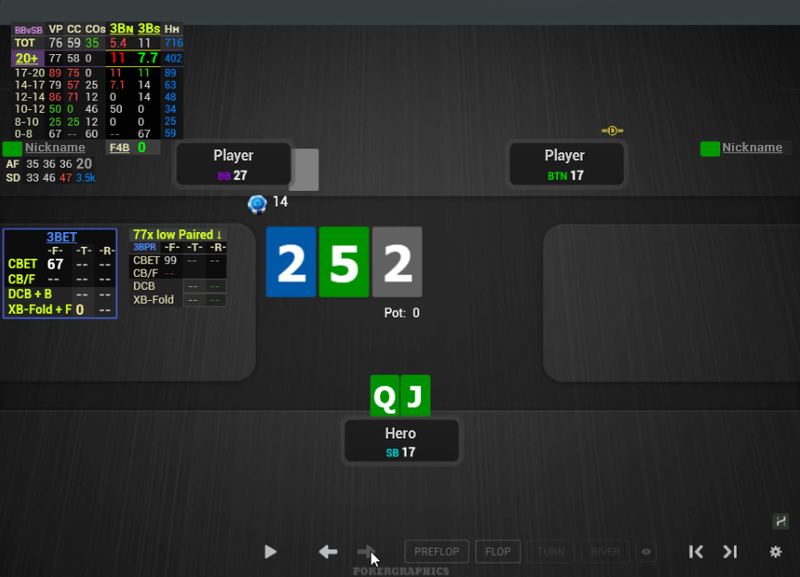 Using of these programms allows HUD to obtain information dynamically (while playing) about the current players stacks, it shows HUD straight from the first hand (not from the second like PokerTracker, Holdem Manager and other trackers), allows to track the history of the current hand. 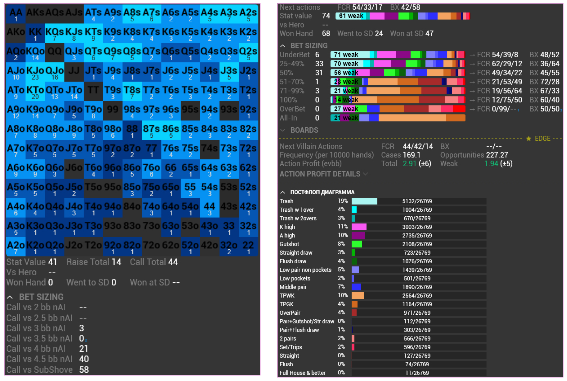 SmartGo Hud automatically highlights stats for current effective stack (in 3way simply outputting the stats in bold, and in HU uses a combination of highlighting, frame and bold). 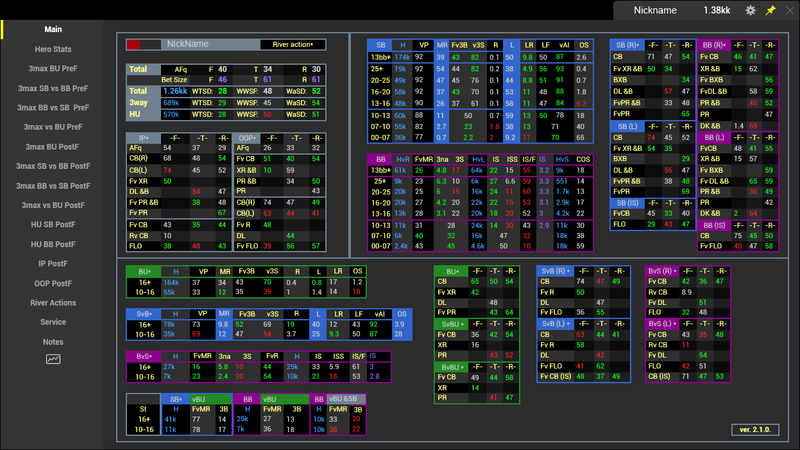 Hud allows to display graphical charts (heat maps) for all statistics. 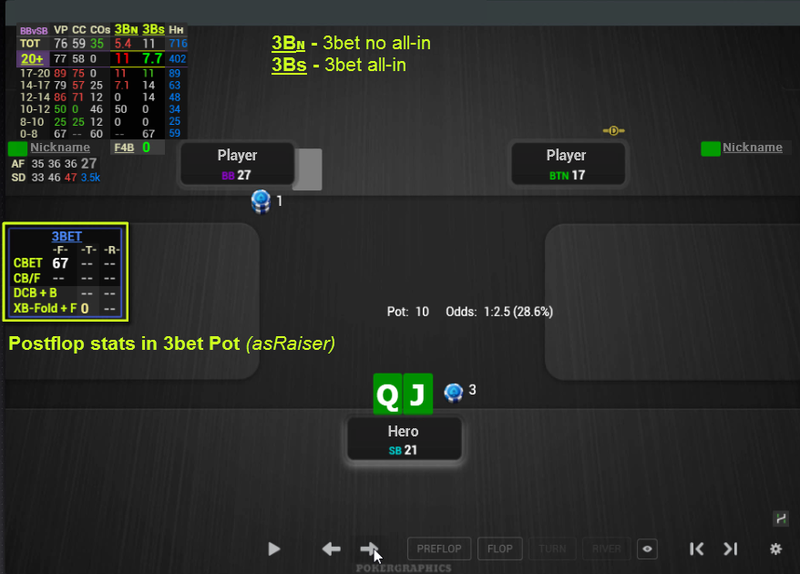 On PokerStars this function is implemented in text form, in accordance with the rules of this room. 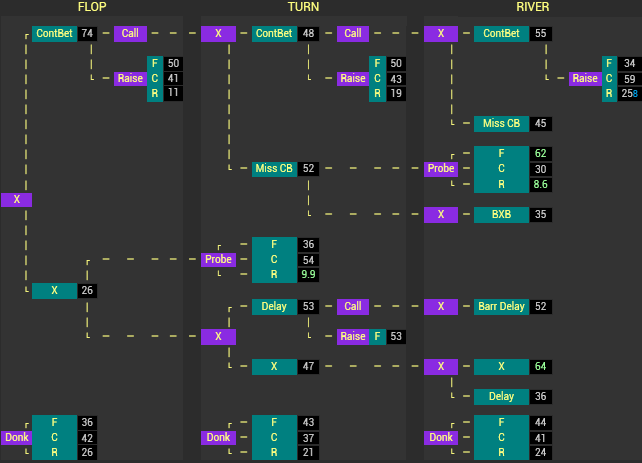 Functional diagram output works in popups for all rooms without exception, which additionally allows to make an intuitive analysis of gaming sessions. All stats in the hud have color ranges depending on the aggression - green is more tight, gray is the normal, reds are more aggressive. 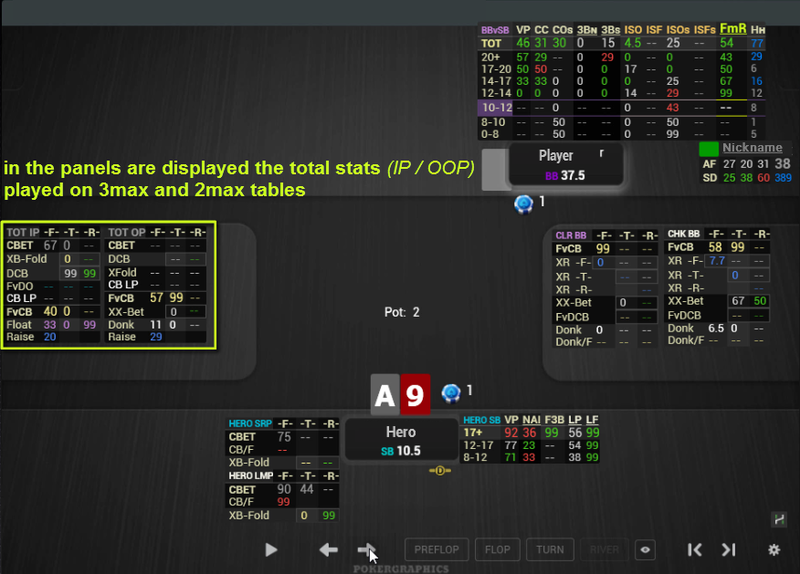 The config contains two versions of the hud with a bright and grinder (quiet) coloring of stat ranges. 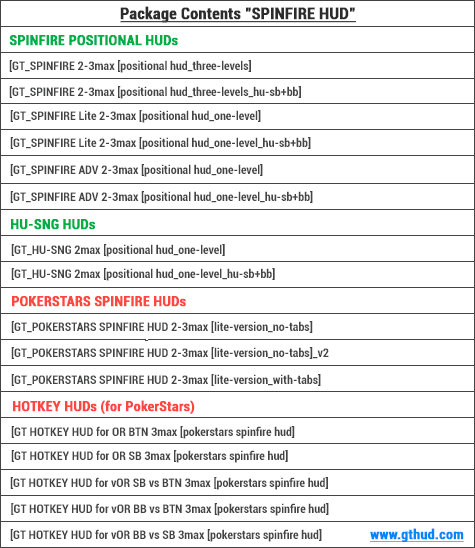 Tables of hud and popups are open for editing - you can make changes and adjust for yourself. Updates are free for users. Instructions for updating are in the description. 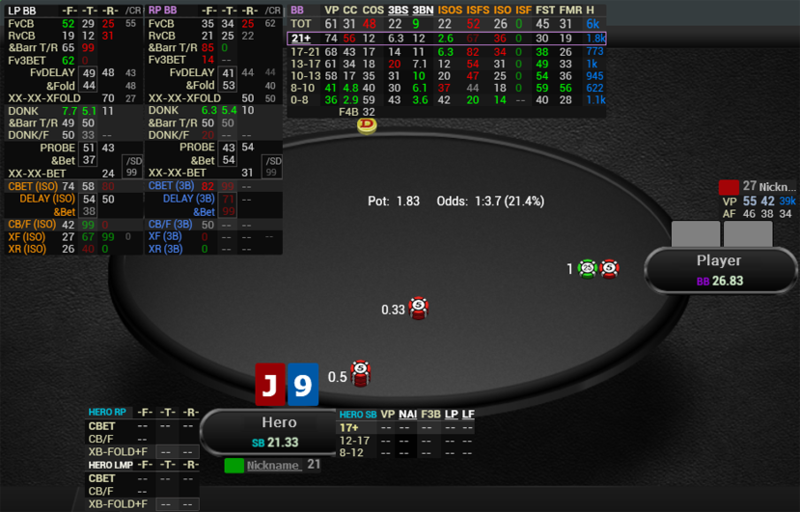 Description SmartGo Hud. Explanation stat cuts. 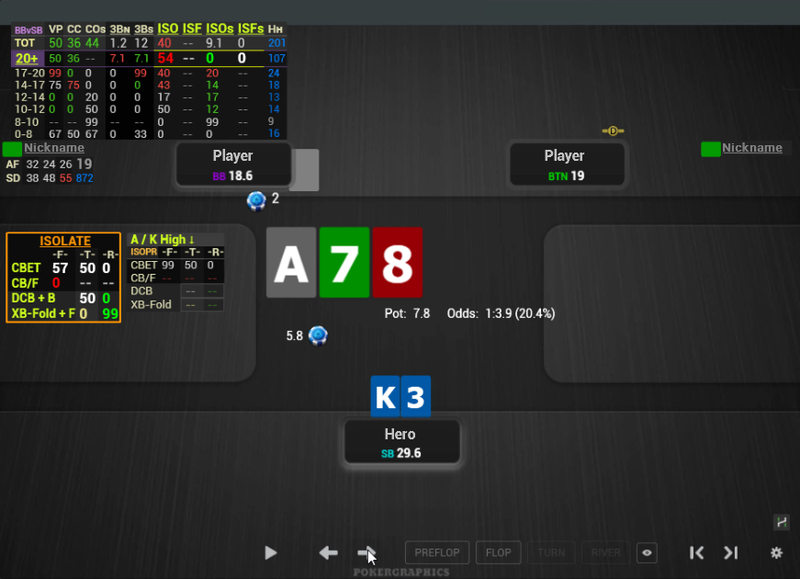 SpinFire Dynamic HUD is created specifically for 2 – 3max SnG tables and allows to display only relevant statistics for each player at the table depending on the situation or on the situation in the given hand and the preset conditions: players’ positions, board texture and actions. 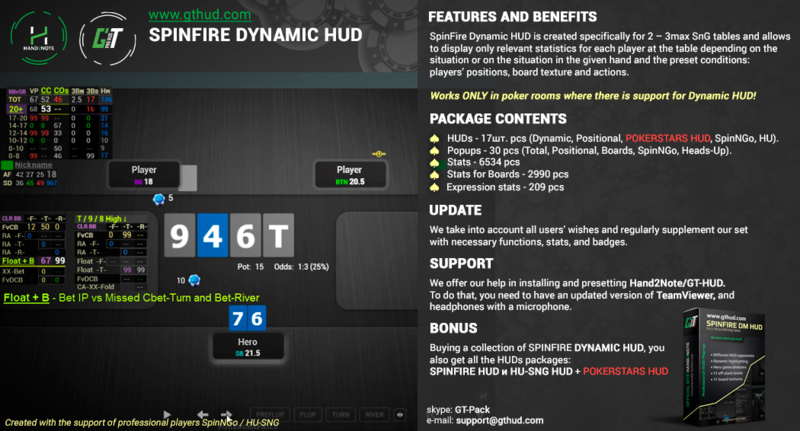 SpinFire Dynamic HUD only works in the PartyPoker room! 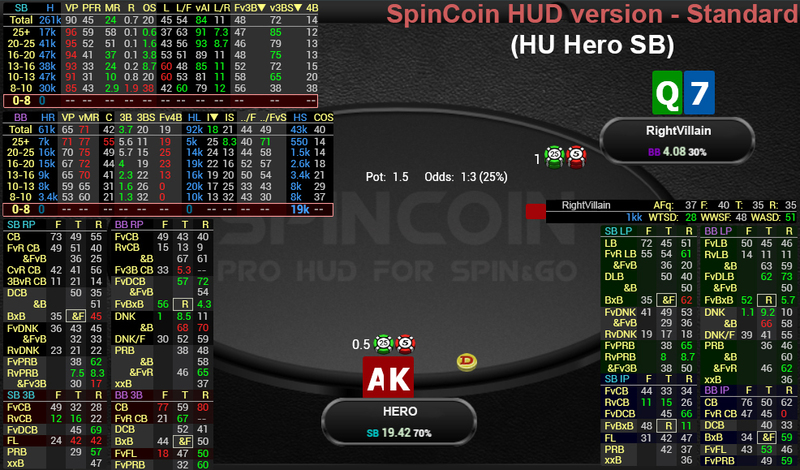 The market is full of Spin&Goes HUD's, developed by developers, who don't even play this format. 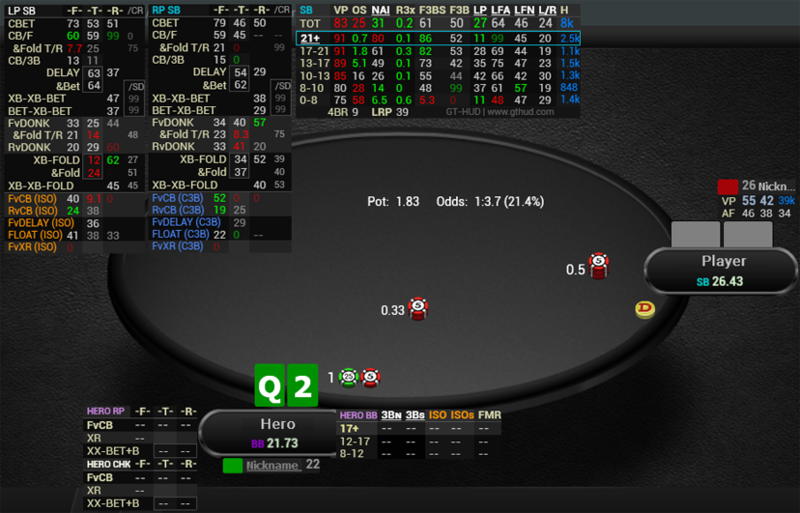 This HUD developed by a long time full-time grinder, who knows which stats are relevant. 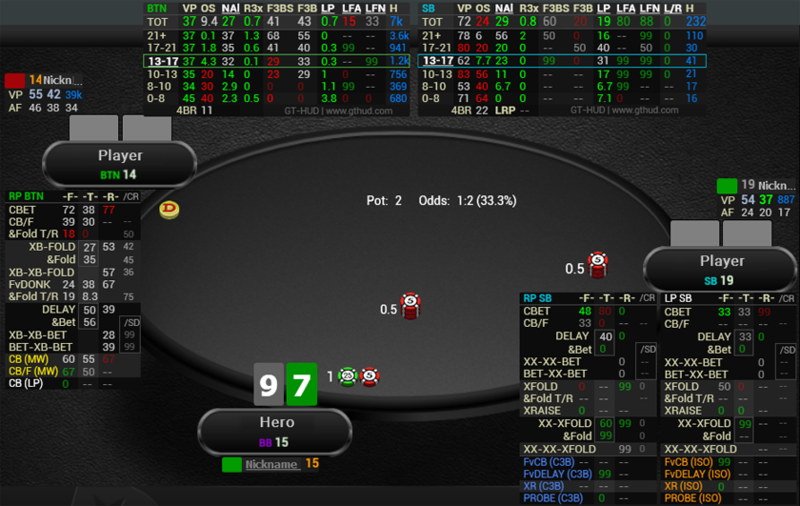 Simple design and comfortable HUD easily fit on tables. 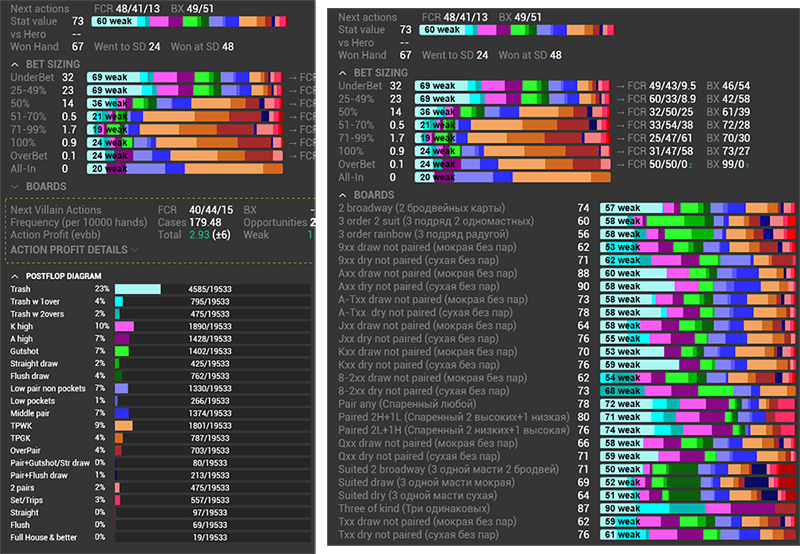 HUD was tested by comparing stats with other trackers and by playing, it has no bugs (a lot of h2n spin hud's on market has VPIP bugs). If something unfamiliar you can always ask.